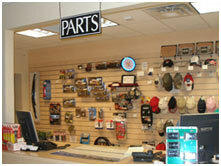 We are authorized to sell Ram Parts and Accessories! Elk Grove Ram Parts and Accessory Department Manager Kerry Bowen is happy to announce we are an Authorized Factory Dealer for all Mopar parts, including Jeep and Chrysler. This helps us serve all of our Elk Grove Chrysler Jeep customers as well as Sacramento Jeep, Sacramento Chrysler and Sacramento Ram owners! We always offer online Ram parts and Ram accessory specials, and will soon be posting our Chrysler parts and accessory specials as well as Jeep parts and accessory specials. We started as Lasher Ram in 1978 and the Lasher Auto Group has been selling repair and maintenance for vehicles in Sacramento since 1955. We are still family owned and operated. Our new processes and technology helps speed up the ordering process and will even automatically email you when your Genuine Mopar Parts and Accessories arrive at the dealership! Click here to order Mopar Parts online! Click here to see our Mopar Parts and Accessories Specials!